This is the ‘blue’ variety of Cattleya intermedia and just one of the three clones we showed at London. 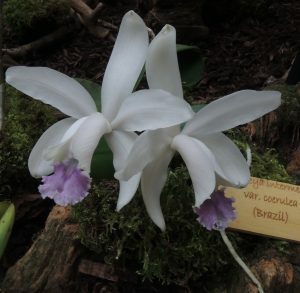 The species is bifoliate (two leaves on each pseudobulb) and comes from the Mata Atlantica (coastal Eastern Brazil) where we have seen it growing in forest at 1000m although it is present right down to scrub forest by the sea. This means it grows warm to intermediate and loves our Warm Americas Section (Minimum 15C) where we keep it right up in the roof of the greenhouse for maximum light and warmth.